The reporting for this article occurred on Tuesday, January 8, 2013. At the time, the staff and spouses of Emmanuel Community UB church (Fort Wayne, Ind.) 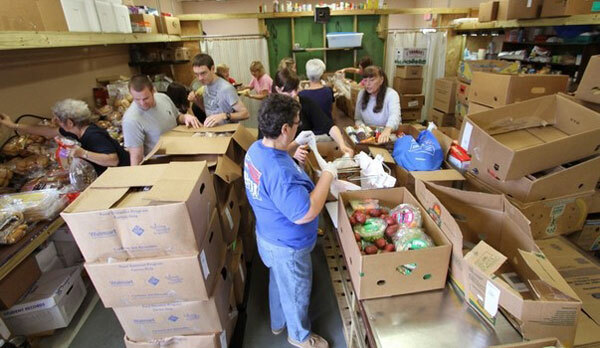 were in Florida on a staff retreat, and they took this day to serve at First UB’s food pantry. As a result, nearly all volunteers who appear in the photos are from Emmanuel. 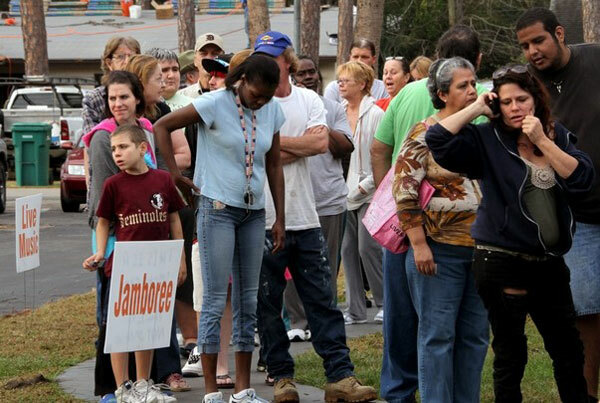 The article was published January 10, 2013, by the Daytona Beach News-Journal. 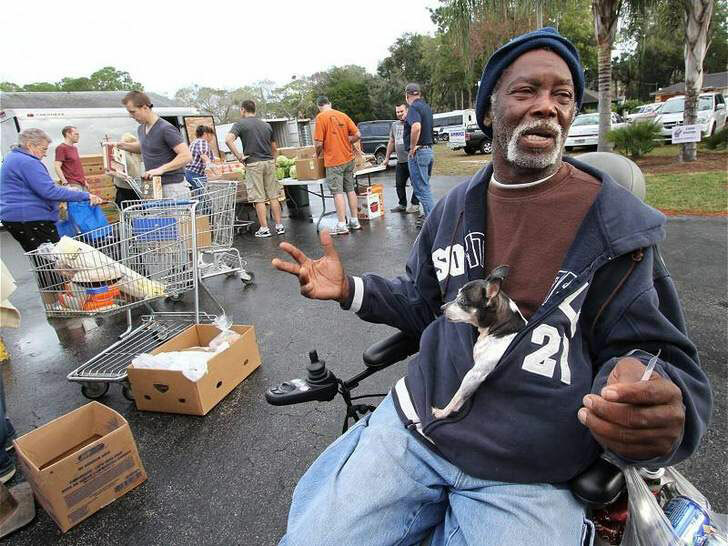 With his 15-year-old Chihuahua peeking out from inside his jacket, James Maddox rolls his wheelchair up to First United Brethren Church (Holly Hill, Fla.) to get in line for a large box of food after a half-hour ride in his motorized chair from his home. 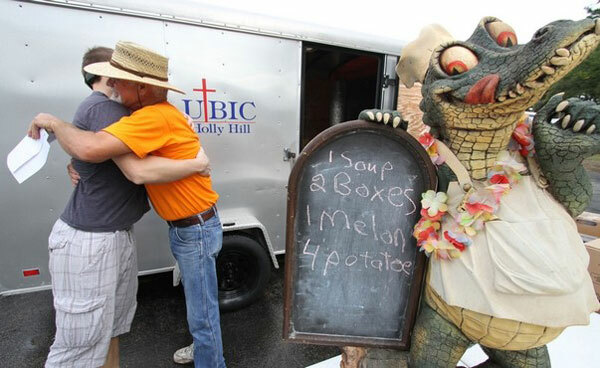 The 65-year-old, who is on disability because of spinal and hip problems, has been getting help for about four years, starting when the food pantry was with another church in Holly Hill that closed more than a year ago. 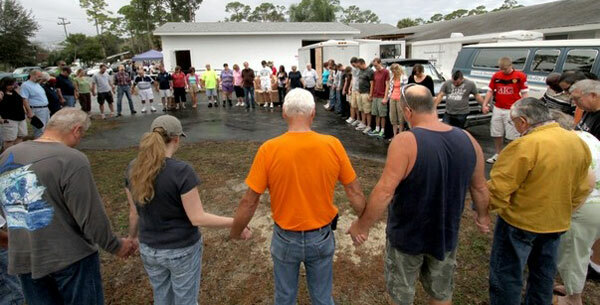 The United Brethren moved the pantry from Open Bible Church in December 2011 after initially helping out the church at its location when Open Bible’s pastor passed away. A new building was constructed for the pantry, helping to serve more than five times the amount of people previously served, according to officials at Second Harvest Food Bank of Central Florida. 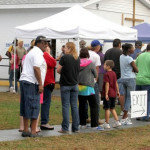 The small church in a short time has become the largest single-site pantry in Volusia County that receives food from Second Harvest, not including Halifax Urban Ministries and its five locations, according to Bob Thomas, branch manager in Daytona Beach for Second Harvest Food Bank. 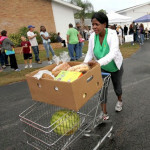 Second Harvest distributes food to 105 partner agencies in Volusia County, including 70 food pantries. Maddox said the church helps him with food because the food stamps he receives don’t last the whole month. First UB spent about $31,187 on food in 2012, serving about 71,000 people and distributing almost 673,000 pounds of food. 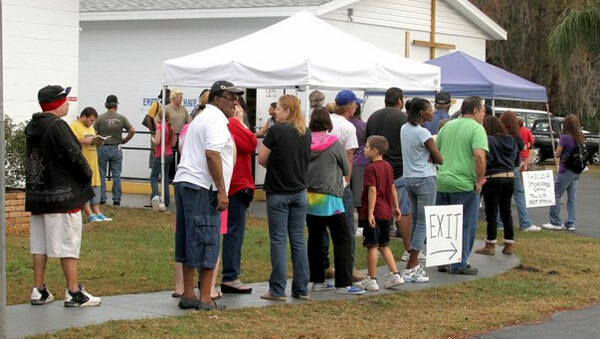 The total number of people served includes people coming to the pantry more than once. 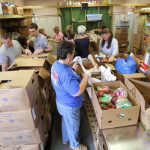 The church served 21,824 people in the last few months of 2012, compared with 3,673 people in the previous location for April, May and June 2011, according to Second Harvest. 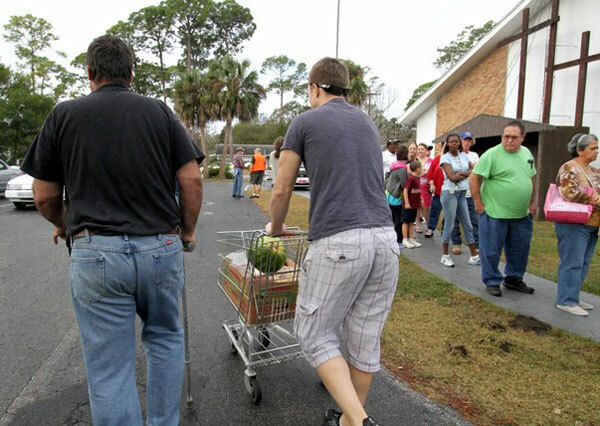 Overall, Second Harvest and its agencies in Volusia County distributed 4.4 million pounds of food last calendar year, up about 1 million pounds from 2011. Second Harvest is focused on providing more fresh produce, which is free to agencies, and distributing more low-sodium, sugar-free food. 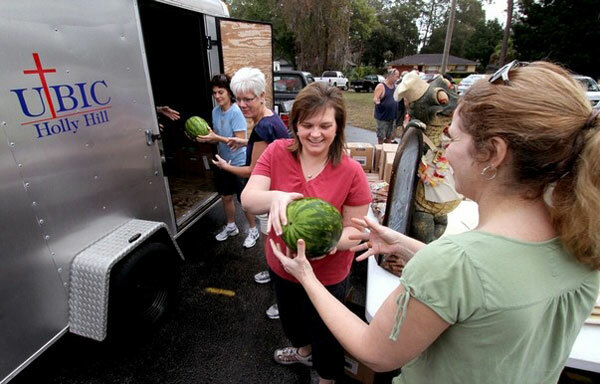 Agencies receive free fruits, vegetables, dairy and baked goods, but pay 18 cents a pound to Second Harvest for meat and canned goods. At First UB, more than 150 volunteers help the food pantry, which also provides hygiene products and other items. 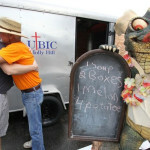 The church gives out about 840 boxes of food a week, on Tuesday and Thursday from 9 a.m. to 1 p.m. and between Sunday church services. People can come twice a month, but any new clients may be even more limited on how often they can get food. First UB, which has about 350 people attending three church services on Sunday, also took over the private K-12 school from Open Bible Church and serves about 90 students. McKeown’s youngest son, Josh (left), is the youth pastor and principal of the school. Josh and his brother, Matt (right), do most of the preaching on Sunday, their father said. Jeff Lilly, one of the officers from Open Bible Church who was also the temporary pastor, said church members thought they would have to shut down everything after their pastor, James Baker, got sick and later died. 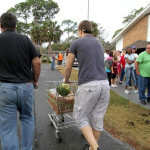 “We would have had to close the doors (on the food pantry). 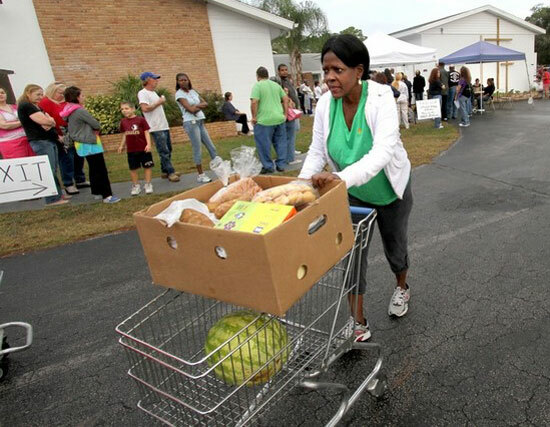 We couldn’t have done it,” said Lilly, who is still involved in the food pantry. Joyce Dismuke, 57, of Holly Hill, who is on disability, has received food off and on for a year from First UB. “They have been a blessing for me. 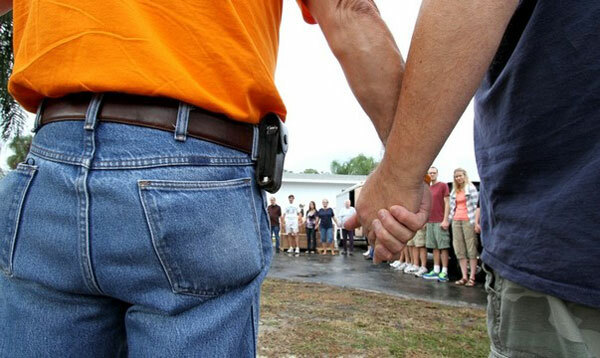 I love when they pray with us, too. The people here have a beautiful attitude,” said Dismuke, who also gives extra food she receives to other neighbors who need it. Keith Chandler, 57, of Holly Hill, also said his food stamps don’t provide him enough to get through the month. He walks with a cane from knee problems. “They are friendly and helpful to us,” Chandler said before volunteer Jon Cavarretta carried out his food. The Global Ministries Summit was held January 20-24 in Chiang Rai, Thailand. Persons serving fulltime with Global Ministries or as nontraditional staff were invited, and all of their expenses were covered. Altogether, 28 persons, eight of them children, attended. Frank Y, associate director of Global Ministries. Brian and Lynette Magnus, from Guelph, Ontario. Jeff and April Dice, and three children, nontraditional staff serving part of the year in Nicaragua. Galen and Maritta Fiedler, and two children, nontraditional staff serving in Germany. Bryan and Emily Gerlach, appointed to begin a new ministry in Thailand later in 2013. Jessica Hollopeter, serving with One Mission Society in Indiana. Miriam, Jana, Anne, and Jenaya, serving in undisclosed locations. Rev. Yiu, superintendent of Hong Kong Conference. Carol Chan, the missions director from Hong Kong Conference. They all met at the Phowaldol Resort on the outskirts of Chiang Rai, a city of 200,000 people in northern Thailand on the border with Myanmar. The speaker was Brian Magnus, bishop of the United Brethren Church in Canada. Brian also chairs the International Executive Committee, and presides at sessions of the international General Conference. He spoke five times to the group in Thailand. Since everyone spoke English, no translating was needed. Jeff Bleijerveld: Much of our staff is already located in Asia, so it served well as the gathering point. It also kept expenses low. We stayed at this very nice hotel for about $35 per night, per person. It was a wonderful resort with individual cottages, so even families with children had a two-floor cottage. It was very comfortable. Frank was the organizer and did a lot of the planning. A lot of credit also goes to Peggy Sell, our administrative assistant at the time, who handled a lot of the logistical work. We originally planned that Peggy would join us. It’s always a challenge with people coming from different places, and arranging transportation to from the airport. For some of our staff, being treated to a vacation in Thailand was different, and some even felt uncomfortable explaining it to supporters. But most were very grateful for the opportunity to meet each other, to step away from ministry, and to be refreshed spiritually. Donna Hollopeter: Most everybody arrived by Saturday night. The Dice family didn’t arrive until Sunday, so they missed the visit to the mountain churches on Sunday, as did the Fiedlers. Jeff: The Fiedlers were delayed two full days because of a variety of things—ice storms in Germany which shut down the autobahns, bad weather at Heathrow airport in London, and then a minor strike with Thai Airways. But they made it for two days of the meetings. Of all of the Global Ministries families, the Fiedlers have probably been under the most pressure and stress. Maritta’s father has been fighting cancer for many years. He had just come home from the hospital; after they returned to Germany, he went back into the hospital and is now in a coma. They really appreciated the event. They did plan to stay two additional days to relax and spend time as a family. Donna: Brian Magnus did a phenomenal job. He took five characters from the Old Testament and talked about their lives, their character qualities—good and bad—and the impact that they had on the lives of other people. Then he asked us to consider how our lives and character qualities impact others positively or negatively, and how we reflect Christ. Jeff: We deliberated beforehand whether this was a time for building up and encouragement and spiritual challenge, or a time to talk shop and strategize for the future. We decided we couldn’t do both well, so we would focus on missionary care. Brian and Lynette Magnus are both natural encouragers. Everybody seemed very eager to get to know each other. They stayed up and played card games together. There was no sense of cliques. Donna: We began each session with devotions, and with praise and worship. They all commented on how much they enjoyed worshiping together. During the sessions, they were very careful to mix up who they sat with, so they could have conversations with people they didn’t necessarily know well. Jeff: Brian and Lynette celebrated their 30th wedding anniversary last June, so they built into the trip an additional week. 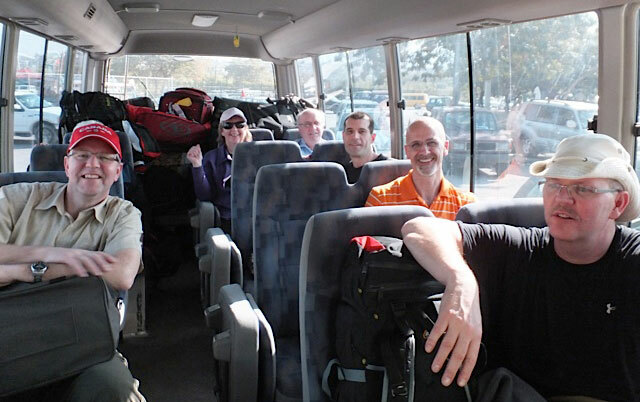 They went to Chiang Mai, a larger city about two-and-a-half hours to the southwest. It’s known for its zoo with panda bears, and its ancient waterway built into the city. They wanted to take some time to enjoy and relax before going back. Donna: They were trying to decide how to get to Chiang Mai, and decided to take a bus. There were three levels of ticketing. Brian thought, “This is special, so I’ll take the most expensive ticket.” Which was equal to $10. Jeff: Again and again, as you run through the numbers, you realize, this is really affordable. Donna: Three families brought children. David and Melissa Kline have three young children, Jeff and April Dice brought their four children, and Galen and Maritta Fiedler (from Germany) brought their two children. The kids were very good. Even though they hadn’t met before, the younger kids very quickly developed relationships with each other. You’d see them walking down the pathways, arm in arm. It was neat to see. Jeff: The hotel staff were fabulous. They even provided childcare. The lady in charge of childcare remarked how well behaved our children were, that they weren’t “naughty,” as she put it. She got one day a week off, and it fell on the day we left. Yet she came to the hotel all day just to say goodbye to the children. Donna: The families with children banded together to buy gifts for the childcare providers, who said that had never happened before—nobody else had thanked them or given them gifts for taking care of their children. Miriam said she had forgotten some of the issues families deal with on a regular basis, like trying to coordinate naps for kids along with all the activities planned. She kept remembering how it was when their boys were younger. With a family, there are a whole lot of other dynamics that single missionaries don’t have to deal with, whether you are on the field or at a rest-and-relaxation place like this. Donna: On Sunday, we went up to the mountain churches, where we have two churches and one church plant. It was about a two-and-a-half hour drive in a van, with very steep and narrow roads, one curve after another. We left about 6:45 for the 10:30 service. Jeff: At one point, we stopped and looked directly across the border into Myanmar. Even where the church is located, you’re within a mile of the border with Myanmar. It’s quite a porous border, which is a concern for the Thai authorities. They have the drug traffic fairly well controlled, and have tried to stamp it out. But some of the other countries don’t have the same capabilities. Jeff: I have no idea what the Akha people heard me say. I tried to stay with a simple narrative—Jesus and the disciples and the storm on the Sea of Galilee, and how God is greater than the waves. The people were intrigued with the Kline children, because the weren’t used to seeing three blond-headed kids. The kids came away with a lot of loot. They made a purse for Mia Kline, bracelets, and a necklace. The people kept rubbing their hair, because they were intrigued by how wavy and curly it was. The church sits on a hillside. After the service, we went down the hill to a vacant lot where they played their own version of soccer—a little bit different than the soccer we know. Brandt and Mia Kline played soccer with the Akha kids. Jeff: In the mountains, when you kick a ball out of bounds, it goes way out of bounds. The Thai kids were careful to keep it in bounds. Donna: After that, we were invited back to the home of one of the pastors for tea and fruit. Then we went to see the other church building. Finally, before we left, we went to Pastor Lee’s home for lunch. Donna: Our last day together, we took a sampan—a long narrow canoe with a huge motor on back—up the river to an elephant farm, where there were many, many elephants. We all rode elephants for an hour—up the hillside, down the hillside, into the river. For a little bit of money, 20 baht, you could buy a bag of food—green bananas and sugar cane—to feed your elephant. Two people rode at a time. They would bring the elephant to a tower, and you would climb onto a two-seater bench. And off you’d go, with a Thai man riding on the neck of the elephant. The route included going into the river. Then you went onto the bank to another tower, where you got off the elephant. Even with the Thai rider and a set route, the elephants all seemed to follow their own mind about what they would do. Any time they came near foliage, they came to a total stop to break off big chunks of plants and snarf it down. We were supposed to be following this path, but four elephants decided to cut across a field instead. The riders kept saying something to the elephants to get them back on track. Then there were some that, instead of going partway into the river, decided they wanted to cross the river to get something to eat on the other side. Jeff: If you think it’s difficult matching yourself to the rhythm of a horse, you should try riding on an elephant. It’s a total core workout. You can’t match it’s movements. There is no going with the flow. After that, we did some shopping with some of the village vendors, and got back to the resort, had lunch, and then took off again for the Golden Triangle area. Jeff: We went through the House of Opium, a museum which tells the story of the opium trade and how it impacted not only Thailand but much of Asia during colonial times. Donna: There was a lot of reading, along with videos. There were amazing facts about how even the CIA and the British East India Company were involved in the opium trade. Jeff: It helped us understand why missionaries who entered China with opium traders were called White Devils. For a Westerner, there were may humbling moments. Thailand, Myanmar, and Laos. The Thai royal family personally paid to develop the museum, which is truly world class. Donna: Thailand used to be an absolute monarchy, but now it’s a constitutional monarchy. Their king is 85 years old, and the queen is 80. They are dearly loved, even revered. He has been on the throne for 60-some years. Both of them are in ill health. They no longer live in the palace, but have taken over a floor of a hospital in Bangkok. Jeff: As soon as you arrive in the country, you begin noticing photos of the King of Thailand. The Thai people think very highly of the royal family. As an outsider, if you make a comment perceived as negative to the government, it is not appreciated. Donna: One of their largest celebrations each year is on the birthday of the King, December 5. All industry closes down, and they have an official day of celebration. Huntington University announced a tuition freeze for the 2013-14 academic year. It applies to all incoming and returning students, including traditional undergraduates, adults enrolled in professional programs, and graduate students. Huntington University will also continue to safeguard its students’ financial success through its innovative Loan Repayment Program. The program reimburses all or part of a graduate’s loan payments if their employment income falls within certain thresholds. Huntington previously adopted a tuition freeze for the 2004-2005 school year. Since that time, Huntington’s tuition increases have been low. Across the United States, the average tuition at four-year private institutions this year is $29,056 and the total cost of attendance averages $43,289, according to The College Board. Currently, Huntington’s tuition ranks 23rd out of the 31 independent colleges and universities in Indiana and 56th out of the 109 members of the Council for Christian Colleges and Universities. Huntington University’s undergraduate tuition will remain locked at $23,300 next year. Room, board and fees will rise slightly to bring the total sticker price to $32,200, or an overall increase of 1.6%. This figure includes a new technology fee which will underwrite a campus wireless and cloud printing initiative. “Due to generous institutional aid through scholarships and grants, the average student only pays about 60 percent of the full tuition amount before other sources of financial aid, such as state and federal grants and loans, are factored in,” said Jeff Berggren (right), senior vice president for enrollment management and marketing. He also noted that more than 90 percent of undergraduates receive financial aid in the form of scholarships, grants, loans or work-study assistance. He added that all students should file the FAFSA and use tools such as online net tuition calculators to look beyond the sticker price. Tuition for HU’s professional and graduate degree programs will remain at current levels for next year, between $348 and $466 per credit hour, depending on the program. 30 Jan Jan. 30 Update on Charles Malson, Sr.
Beth Palmer wrote the following update on Wednesday, Jan. 30: “Daddy is still in a coma. He has shown some signs of coming around today. His breathing test indicated he wasn’t ready, so they couldn’t remove the ventilator. He isn’t awake enough to fight the tubes, and that is fine with us. They have taken cultures, etc., to see why he has a slight fever. They put in a pick line a few minutes ago, have taken the ex-rays, and plan to take out the central line if the pictures indicate a good line. “Lots of our family and many friends have dropped by to support my mom and the rest of us here during this difficult time. My mom was looking at the list of those we knew who had come to visit, and the list contains 70 different names. We didn’t think to keep the names of those who have called or sent texts. We appreciate everyone so much. Please keep us in our prayers as family and friends travel to and from the hospital when you pray for daddy. Participants in the January 2013 Global Ministries Summit in Chiang Rai, Thailand (click to enlarge). The dust is still settling from the Global Ministries Summit January 20-24 in Chiang Rai, Thailand. I want to provide a quick “thank you” to all who were praying for us. We achieved our goal of building a sense of “team” among many Global Ministries staff (many whom had never met each other), bringing both encouragement and challenge, and focusing attention on a new area of ministry. Participants represented Global Ministries’ work in China, Macau, Hong Kong, Thailand, Nicaragua, Canada, Germany, India, and the United States. Rev. Brian Magnus, who chairs the International Executive Committee and the General Conference, and his wife Lynette did a marvelous job of doing what they consistently do: encourage people. Brian also provided five challenging workshops regarding leadership based on a variety of Old Testament characters. Other workshops were offered, including maintaining your spiritual health on the field and writing ministry updates to supporters. One entire morning was devoted to simply sharing and praying for every participant. We look forward to telling you more in the days to come, but I wanted to let you know that your prayers were answered. We look forward to what God has for us in the coming days as we rely on his leadership and power to be the ministers and leaders he wants us to be. Dan and Nancy Paternoster posted this January 27 update on Dan. As reported previously, Dan was in a serious bicycle accident in August, and cancer was discovered in the process. A couple months later, Nancy was diagnosed with breast cancer. Dan is a member of the denominational Executive Leadership Team. 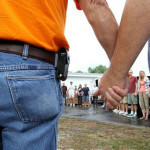 He and Nancy are from Fowlerville UB church in Fowlerville, Mich.
Much has happened this past month. The first week of January we made the rounds of the cancer specialists and decided that we were not pursuing any further treatment for Nancy’s breast cancer at this point. All the cancer was removed during the biopsy, and no futher cancer was found during the subsequent surgery. There will be follow-up mammograms every six months for a few years. Dan had his bladder scoped mid-January, and the urologist saw a “rough” spot which wasn’t normal. He wasn’t sure if it was a reaction to the chemo treatments, scar tissue from his previous surgery in October, or a cancerous growth. It appeared to be in the same location as the previous tumor. So, this past week Dan had another bladder biopsy and we’re waiting for the results. Earlier last week, Dan had an EMG and it was determined that there is regrowth in the nerve roots on his left side. The doctor who did the test called every resident, student, etc. in his office to see Dan, because it’s rare to see this kind of regeneration after such severe damage. The damage to these roots is what’s causing his inability to lift his left arm past shoulder height. We’re thankful for this good news and looking forward to complete use of his left shoulder, arm, and hand again. The ENT doctor visit confirmed that Dan has excellent hearing, but the humming in his ear is something that will always be there. The change in the shape of his ear canal is due to some cartilage from his jaw (probably when it was dislocated in the accident) pushing on his ear. It doesn’t make a difference with his hearing, but will most likely lead to arthritis in his jaw. Dan’s biggest hurdle to returning back to work and normal life is his vision in his left eye. He still has double vision most of the time and is scheduled to see a specialist in February. Loading the bus–a very nice one. Top: Bins and cases waiting to be sorted; sorting the tools. Bottom: two tables were needed to accomodate the entire work team. 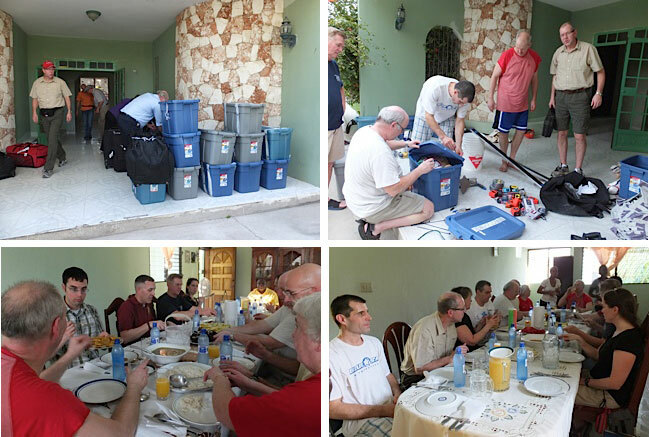 A team consisting of UBs from Canada and from King Street UB church in Chambersburg, Pa., arrived yesterday (January 25) in Haiti. This is a construction team which will work through Monday, February 4, on building a new church in Limbe, in northern Haiti. Although Canadian teams have been to Haiti many times through the years, Limbe is new to them. A medical team will come to Haiti February 5-12. They will be joined by three ladies from Mission of Hope and Dr. Robinson Germain, a Haitian doctor. This team will go to Les Cayes, in the south, to hold several medical clinics. Joan Sider (right), from the UB church in Toronto, has visited Haiti numerous times, and will participate on both of these teams. And, as she always does, she will send back regular reports. Here are excerpts from her report on Friday, January 25. 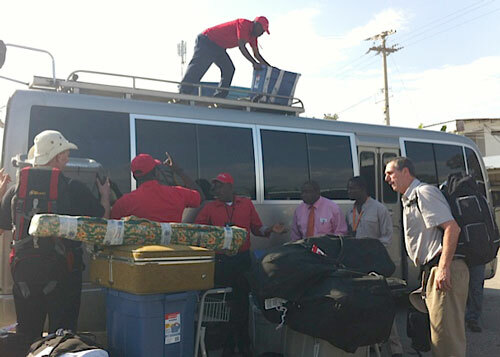 We have arrived–safe and sound with all 24 pieces of luggage. We arrived earlier in Port Au Prince than we thought we would. We left Toronto with a temperature of minus 10, and came to one of 32 celcius–warm indeed, but pleasant. There was a lot more scrutiny with the luggage this trip. When we picked up the bags off the carousel, we noticed several bins had been opened and inspected; they had a tape around the bin saying it had been opened for inspection. I guess that happened in New York. Customs officials here in Haiti opened up a number more. We’re not sure if they were looking for anything specific. One did ask if we had any drugs. We need to pray now that the next team’s meds all get through without any difficulty. The airport is amazing–the changes made since even December when I came with Hermmy are quite remarkable. They are truly trying to make it a first class airport. There are still many porters who all want to help you–and get your tip–but even that is better organized. Our American friends came in earlier than we did and were here waiting to meet us. The big task of sorting all the materials we brought was next on the agenda. Everyone pitched in, and all is now in readiness for tomorrow’s journey up to Limbe. It is a 6-8 hours trip. We know the highway up as far as Gonaives is good. I tried out my Magic Jack, a device that connects to my computer and allows me to call anywhere in the US or Canada for free. Well, it costs $29 per year. I’ve talked with two people. The connection wasn’t too bad. It depends on the strength of the internet coming in. 26 Jan Jan. 26 Update on Charles Malson, Sr.
Beth Palmer sent this update on her father, Charles Malson, Sr., along with some background on what led to his hospitalization. Rev. Malson is scheduled to undergo surgery Saturday afternoon, January 26. “On Wednesday morning (January 23), Charles Malson fell in the bathroom, striking his head. When my mom found him, he was cold and unresponsive with wounds. He was taken to the Carson City hospital, and they transfered him to Sparrow Hospital in Lansing. “After several tests, they discovered that he had a section of his small bowl area that had detached from the blood source and had died, sending bacteria into his system. They removed this area that night, and he is to have surgery again to attach the two ends if they are healthy. He faces another surgery in a couple days to attach the muscles. There is too much swelling from the two surgeries to do this safely at this time. Huntington University has again been listed among the top colleges in the nation for its online bachelor’s degree programs. U.S.News & World Report named Huntington University as the top private college in Indiana for online education. In its 2013 list of the Best Online Bachelor’s Programs, Huntington ranked 55th of 213 schools nationally. Only six Indiana colleges and universities made the national ranking. Schools are ranked based on student engagement, faculty credentials and training, and student services and technology. Huntington offers five online bachelor’s degree programs for adults in the areas of business administration, not-for-profit leadership, human resource management, marketing and nursing. An associate degree in organizational management is also offered in an online format. In addition, online undergraduate courses are offered to traditional undergraduate students during the summer months. Online hybrid graduate programs are also offered in youth ministry leadership and education. For more information about Huntington’s online offerings, visit huntington.edu/online. Charles Malson, Sr., a retired minister now living in Carson City, Mich., is currently in an induced coma at Sparrow Hospital in Carson City. 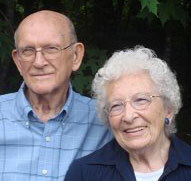 His wife, Doris, found him unresponsive on Wednesday morning (Jan. 23). He came around after treatment. On Wednesday night, surgery was performed to remove some intestine that had lost blood flow due to a recent fall. He will have surgery again today (Thursday, Jan. 24) to reattach the intestine. He is stable, and will remain in an induced coma as he recovers. 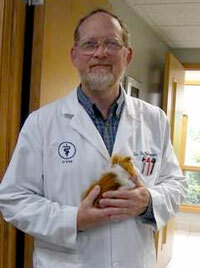 “Prognosis seems favorable,” says son Chuck Malson, senior pastor of Brown Corners UB church (Clare, Mich.). Updates are being posted on the Brown Corners Facebook page. The Malsons pastored the Brown Corners church 1952-1957, and then planted the Richfield Road UB church in Flint, Mich. In 1981, Rev. Malson was elected fulltime superintendent of Michigan Conference. He continued in that role until 1991, when he and Doris retired. They celebrated their 70th wedding anniversary in November 2011.